So, you’ve finished a book. You carefully wrote an outline, craftily developed your characters, sweated out the formatting to make every page perfect. If you don’t get yourself a copyright through proper and legal channels, you don’t want to self-publish that story. If you do, I can download it, put my name on it and sell it as my own — legally. If you think slapping a copyright symbol and writing a disclaimer is enough to protect your rights, you might be wrong. 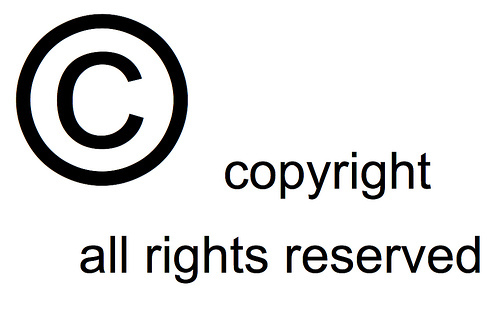 Getting a copyright is pretty easy…but it’s not that easy. You can’t have one unless you know what it is. When you own the copyright to a work — usually a piece of music, a book, artwork or a film — you and you alone are allowed to sell, distribute and duplicate that work. This means that if someone else wants to sell and/or distribute your work, they’ve got to go through you first. Copyrighting your book legally marks you as the owner, and it’s something you’ve got to do before you make that book available to the public in any form or fashion. …If you live in the United States, that is. Obtaining a copyright is a legal process, and there may be certain channels you’ve got to go through in order to get it. If you live in the US, you’ve definitely got some work to do before you start happily self-publishing. Elsewhere…well, it’s quite a bit easier. If you create and produce your book in the UK, it’s automatically copyrighted. The UK copyright goes into effect the moment an idea leaves its creator’s mind and becomes an object (rather than a concept). The moment you type your first word, you’ve got a copyright on your work. You do not have to be a citizen of the UK for this copyright law to protect you; as long as you create and produce your work within the UK, you’re covered. The UK Intellectual Property Office offers more specific details. Canada’s copyright laws are similar to UK laws. Once you create and produce your work in country, you’re protected under Canadian copyright law. However, you should take the time to legally register your work through the Canadian Intellectual Property Office, a process which does include some monetary fees. If you live in the US, simply creating and producing your work absolutely isn’t enough. As an author, the responsibility falls to you and you alone to officially copyright your work and register it with the Library of Congress. It’s a relatively simple process that includes filling out a form and sending a copy of your work (for inclusion in the Library, of course). Use the online Electronic Copyright Office for ebooks and digital works. Filing the copyright does cost money, but it’s a necessity if you want to be legally recognized as the owner of your work. This post originally featured on Jade Varden’s author blog on 17th March 2012. Author Jade Varden is a regular guest contributor on Aside From Writing. The Writing 101 features originate from her own blog at http://jadevarden.blogspot.co.uk where you can see more of her thoughts on writing, as well as her own books. Her debut novel Justice is available now, with The Tower scheduled for release in summer 2012. Read our review of Justice here. This entry was posted in Guest Posts, Writing 101 and tagged author support, author thoughts, copyright, Jade Varden, technique, writing 101, writing skills. Bookmark the permalink. I have to admit, something loosened somewhere within me until I saw the bit about it being automatic in the UK. This is really interesting, I’d never really thought about it. Luckily, I’m also in the UK. Phew! Hehe I was sitting here mentally arguing with your article until I got to the ‘except in the UK’ part. We’re certainly fortunate that it’s easier here than other places – for once. Well done on pointing this out, I hope it helps a lot of authors over the pond. Thank you so much for this post! I am (slowly) working on a book, myself, and honestly never thought about this! I just figured if I published it, somehow, then that would be enough to say it’s my work! Thanks for the great information! !